Good sugar vs bad sugar. I’m not convinced that there is such a thing as good or bad sugar. There are alot of people following “sugar free” diets at the moment, largely thanks to a certain best selling book by a certain sorta’ celebrity. For me, it depends on your situation as to whether you should have sugar in your diet, or more accurately how MUCH sugar, as it is practically impossible to avoid. If you’re an active healthy person, sugar has a place as part of a diverse, nutritious diet. Let’s look a little closer at sugar and some emerging alternative sweeteners…. Sugar is a simple carbohydrate, and it comes in two forms – monosaccharides and disaccharides. Monosaccharides are single sugar units and disaccharides are just two sugar units joined together. Examples of these include glucose, fructose (the sweetest sugar, naturally found in fruit and honey), galactose, maltose (found in barley and alcohol) and lactose (natural sugar found in milk). If you’re like me, you like to sweeten things up sometimes. I’m not talking about having sugar and fat laden brownies or meringues for breakfast, I’m talking about a little honey in your smoothie, a few dates or sultanas in your tagine, or some beautiful, natural or dried fruit as snack. Nothing sinister here, and in fact, many of these foods are super nutritious and formulated specifically by nature to nourish your body in absolute harmony. So why the big hoohaa about avoiding sugar? Simple sugars like the ones mentioned above are broken down very quickly in our bodies, and can cause spikes in blood glucose. Spikes in blood glucose levels can cause energy slumps, and prolonged exposure can cause insulin resistance and eventually diabetes. Not good. Additionally, sugar is an energy dense nutrient and consumed in excess, can lead to weight gain (many people also believe that the mechanisms by which our bodies metabolise sugar pose another potential downfall to our health, many of these theories are yet to be scientifically proven however). Lets look at the science, promise I wont get all technical and stuff. Glucose is the simplest sugar unit, when we eat any type of carbohydrate, our body breaks down those molecules into glucose. Why? Because glucose is the fuel that the body can use, it can’t use carbohydrates in other forms to play its role, they must be broken down to the simplest sugar unit glucose. What’s the importance of glucose in our bodies? Glucose is the only fuel source that the brain can use. The ONLY one. Cells in the muscles and other organs can use protein and fat sources of energy to keep ticking over, the brain needs glucose. Whilst we are on the topic, I should point out that the preferred fuel source of the muscles is glucose. Muscles can use alternative fuel sources like protein and fat, but they are less efficient and the body will always look for glucose first. If the cells of the body aren’t provided with sufficient glucose, they basically start to use protein sources to make glucose to supply the brain, nerve cells and red blood cells. I repeat – without adequate carbohydrates, protein is used to make glucose. For all of those gym junkies out there on low carb diets, this means all of that excess protein you are taking in ain’t going to your muscles, it is being broken down and used to make glucose! The body can use fat to make glucose too by the way, but the pathway that it takes to do so creates ‘ketones’ in your blood, which can upset your body’s acid-base balance. This state of ketosis has been touted as an effective way of losing weight, however a prolonged acid-base imbalance can be dangerous, and in severe cases can be fatal. 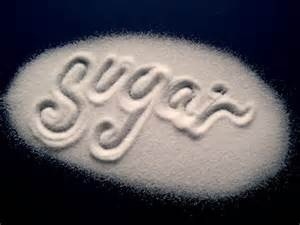 Regarding sugar’s role in fat storage, excess sugar WILL convert to fat in the body, just as other excess nutrients will! Fat, protein, alcohol, sugar – whatever it is, if you are eating too much of it, you’ll see it on your waistline. Lastly, on fruit. Fruit is my friend. It is natures sweet gift to us, and in my opinion should never be omitted from the diet. Fruit delivers sugar, sure, but it delivers sugar all packaged up with fibre, and mixed with essential vitamins, minerals and phytochemicals, all diluted in a huge amount of water. From a South American shrub, harmless in small amounts, some research linking stevia to cancer development, reproduction and energy metabolism. Jury is out on this one. From the cactus plant, low GI, not as sweet as sugar or honey. Contains the same sugar units including fructose. Recommended for diabetics due to its low glycemic index rating. From coconuts, obviously. Promoted as low GI, mineral rich and minimally processed. Also a goodin’. I’ve never used Yacon Syrup, maybe I’ll try it and let you know. Apparently it has probiotic properties due to the chemical structure of its long chain sugar units. It should be noted that many of these are so new to emerge that there has been little research done on them. Also remember, any sugar is a sugar. It is still a dense nutrient that delivers alot of energy per gram, so don’t go nuts thinking that ‘healthier’ sweeteners don’t provide calories. They do. For me, if I’m going to use a sweetener I will try to use something that at least provides some added benefit to my body that plain ol’ table sugar does. So added minerals, lower GI, less processed – thats all good stuff. ← What’s all the fuss about Quinoa?